VATICAN CITY (CNS) — Those who proclaim the Gospel must embrace humility and poverty to give an authentic witness to faith and not use others to climb the ladder of success, Pope Francis said. 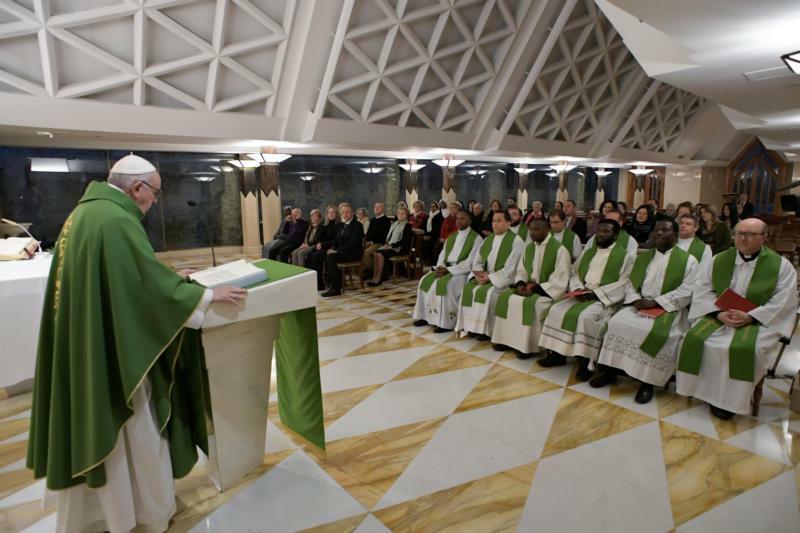 Just as Jesus sent the apostles out to preach telling them to take nothing but a walking stick, Jesus wants pastors to be shepherds who feed their flock and “do not try to take the milk of the sheep, who do not try to take the wool of the sheep,” the pope said Feb. 7 in his homily during Mass at the Domus Sanctae Marthae. “If an apostle, an envoy, one of us — there are many of us envoys here — goes around with his nose in the air a bit, believing himself superior to others or looking for some form of human gain or, I don’t know, looking for a position in the church, he will never heal anyone, he will never be able to open anyone’s heart, because his word will have no authority,” he said. The pope centered his homily on the day’s Gospel reading from St. Mark in which Jesus sends the apostles out two by two with “no food, no sack, no money in their belts” to heal the sick and drive out demons. To be healed, he said, one must be willing to convert, to open one’s heart to God’s word. Christians, “not just a priest or a bishop” but “each one of us, has the power to heal” those who are ailing, the pope said.